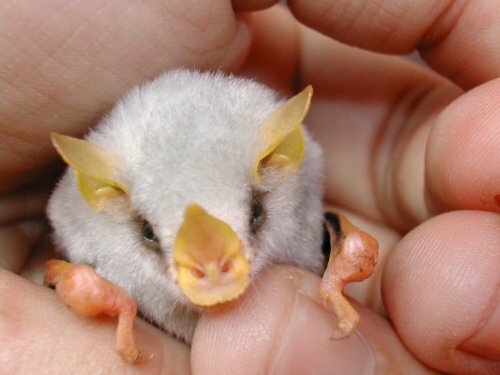 One of the cutest of all bats, the Honduran white bat is a prime example of going against the stereotypical myths about bats. Neither do they live in caves like the others of its kind nor do they have dark coloration on their body. These little creatures are probably one of the most benign things you are likely to come across in Central America if you are lucky. Size: They are a tiny creature, reach a length of around 1.46-1.85 in (3.7-4.7 cm). Weight: They weigh only about 0.2 oz (5.67 g). Wingspan: Their wingspan is 4 in (10.2 cm). Tail: They do not have a tail. Color: They have a gray to snow-white fur with a yellow or amber leaf-shaped nose and ears, a black membrane on the wings. The Honduran white bat lives in the evergreen tropical rainforests from sea level up to about 2,300 ft abundant with Heliconia flowering plants. They inhabit the Central American countries of Honduras, Nicaragua, Costa Rica and Panama. 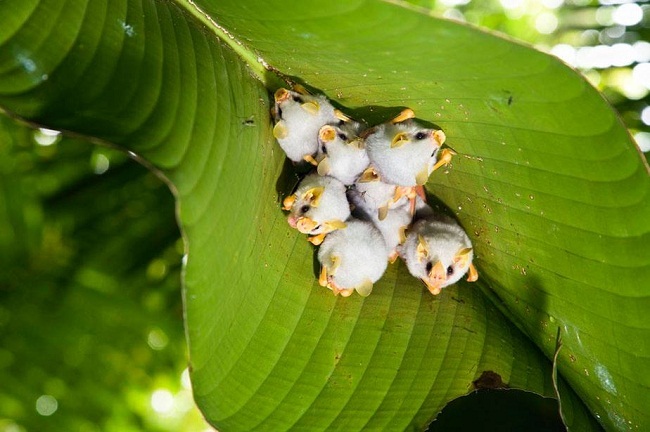 They roost under waterproof tent-like structures made out of Heliconia leaves which these bats construct by cutting the veins of a leaf along the midrib, leading to the two ends of the leaf to slump down under their weight. It is a nocturnal creature, roosting in its tent during the day and flying out at night to look for food. So confident are the Honduran white bats of the protection provided by their tent that they do not fly away and escape from a threat unless the .’ stem of the leaf is disturbed, staying motionless to camouflage themselves from any potential predator. They are polygamous, with each tent housing a single male and his harem of up to six females. 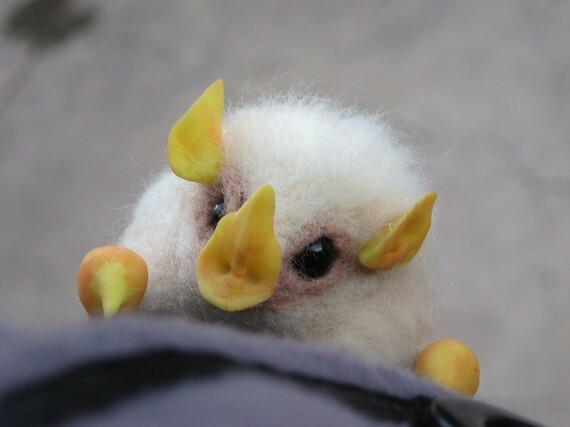 While there is limited information regarding the mating and reproduction patterns of Honduran white bat, the timing of their mating season is such that the offspring is born during spring. The gestation period lasts for a few weeks. A single offspring is born per mother. They have been known to live for up to 20 years. 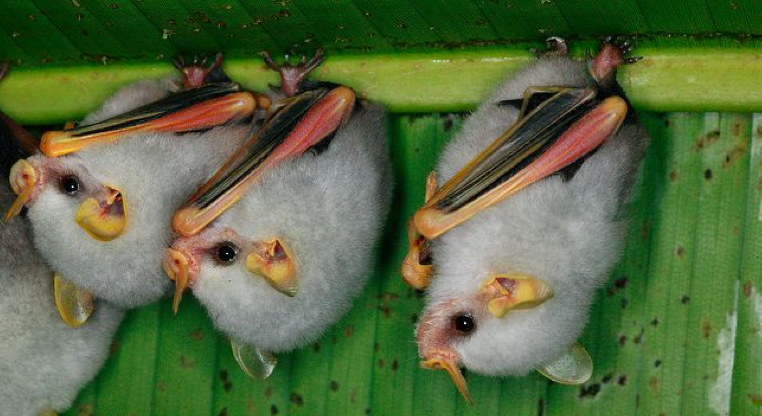 Honduran white bats communicate through touch and visual means. They are frugivorous and exclusively eat fruits. 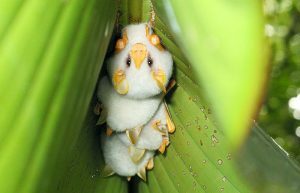 When sunlight filters through the green leaves, the white to whitish coat of the Honduran white bat helps render it nigh invisible. A thick, black membrane, believed to be a protection from the sun’s ultraviolet rays, covers their skull. The Honduran white bat may be preyed upon by owls, snakes, possums and raptors. The Honduran white bat is classified under the ‘Near Threatened’ category of the IUCN Red List. 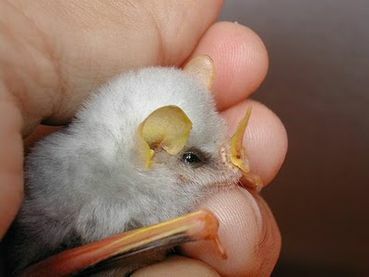 The cuteness of this bat makes it somewhat popular as pets, but having one would entail intensive care on the part of the owner to replicate its natural environment, failing which would lead to health problems. The Honduran white bat is the only species belonging to the genus Ectophylla and is one of only a few species of bats from Latin America to roost in tents. The leaf-shaped nose of this creature gives it the unofficial moniker, ‘leaf-nosed bat’.